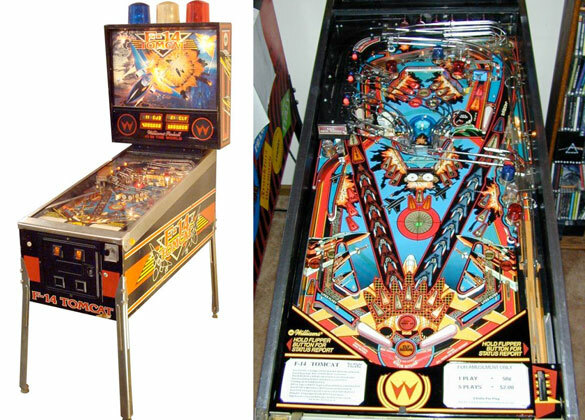 Check out these 1987 F-14 Tomcat Pinball Machines for sale. You will also find parts and accessories including the LED kit, Ramps, Pop Bumpers, Speaker Upgrade, Flyer, Sound Board, Flipper Rebuild Kit, Fuse Kit, CPU Rom Chip Set, Translite, Playfield Plastics, Target Set, Mods, and Custom Target Decals. This is quite possibly the perfect first pin. Great sound, lights, gameplay and the cost is reasonable. The adrenaline rush when you activate multball is still one of the best!